The Lady Eve (1941), starring Henry Fonda and Barbara Stanwyck, is one of the 1001 classic movies you should see. This week, TCM is airing great movies from stars like Rock Hudson, Ann Rutherford, and Michael Caine. Plus, they are putting the spotlight on documentaries and movies about female con artists. So, without further ado, let's jump right in to this week's offerings. Just a note: All times are Eastern Standard Time and the highlighted texts have links to full length articles. 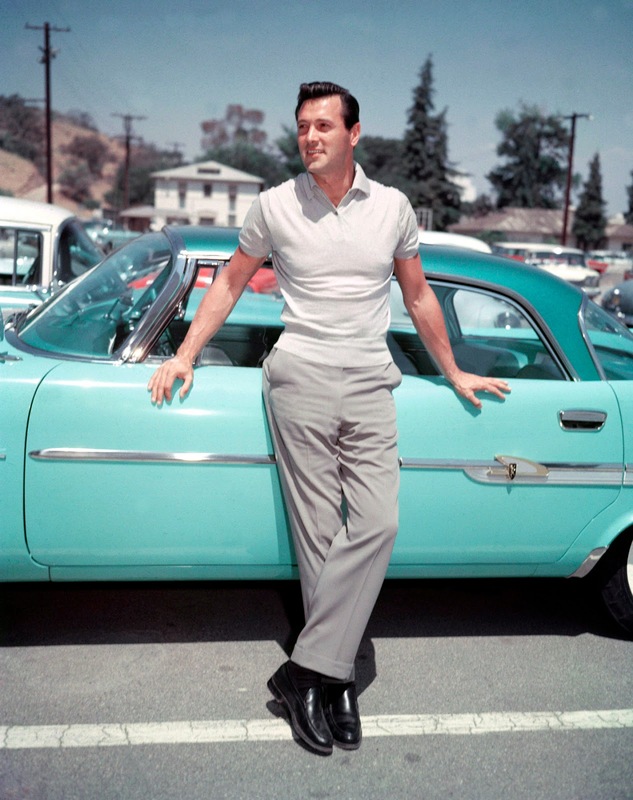 Birthday tributes: Rock Hudson on Thursday. Sunday Prime Time: Two movies from songbird Deanna Durbin. Silent Sunday Nights: The World War I comedy, The Better 'Ole (1925) at midnight stars Sydney Chaplin as a bumbling Cockney infantryman who inadvertently saves the day. TCM Imports: Two Soviet classics about World War II from director Larisa Sheptiko. First, a former female fighter pilot (Maya Bulgakova) finds it difficult to adjust to civilian life in Wings (1966) at 2 a.m. Sunday night/Monday morning, followed by The Ascent (1977) at 3:30 a.m., which tells the story of two soldiers (Boris Plotnikov and Vladimir Gostyukhin) who become prisoners of war. Best Day to DVR: Thursday afternoon/evening. You can start out with Rock Hudson's best film (Giant) at 2:45 p.m. and end with an Ernst Lubitsch masterpiece (Trouble in Paradise) at 12:45 a.m. In between are a Doris and Rock rom-com (Send Me No Flowers), an underrated Veronica Lake film (The Sainted Sisters), one of Barbara Stanwyck's best movies (The Lady Eve), and James Cagney and Joan Blondell as larcenous hotel employees (Blonde Crazy). An image from Nanook of the North (1922). Three daytime picks: The morning theme is movies starring British thespians Beatrice Lillie and Clive Brook. Brook co-wrote, directed, and starred in the comedy On Approval (1944) at 9:45 a.m. about an impoverished British aristocrat who courts a rich widow played by Lillie. Brook gets caught in a love triangle with Irene Dunne and Nils Asther in If I Were Free (1933) at 11:15 a.m. The afternoon theme is movies with "sin" in the title, including Laughing Sinners (1931) at 4:30 p.m., which stars Joan Crawford as a free-living nightclub singer who goes straight for Salvation Army member Clark Gable. Prime time lineup: TCM is turning the spotlight on documentaries each Monday and Wednesday in November. Tonight they are showing the French Holocaust documentary, The Sorrow and the Pity (1969) at 8 p.m.
Late night pick: TCM is airing silent documentaries in late night including director Robert Flaherty's groundbreaking film. 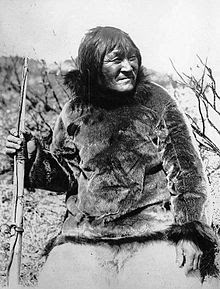 Nanook of the North (1922) at 1:15 a.m., about the lives of native people who live in the Canadian Arctic. Cary Grant, Rosalind Russell, and Ralph Bellamy in His Girl Friday (1940). Three daytime picks: The theme is movies from director Howard Hawks. 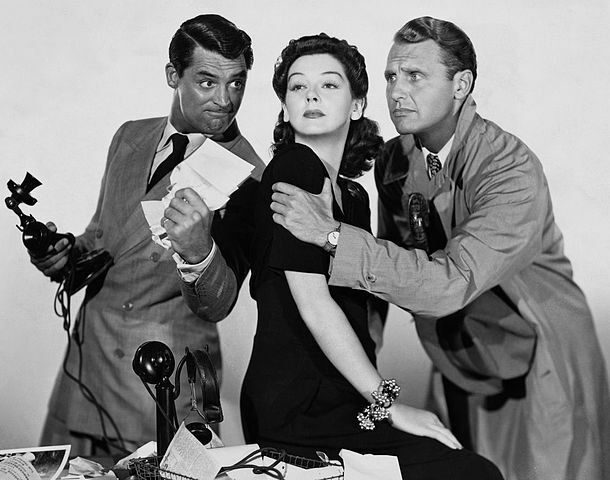 Hawks made excellent films in several genres, including the screwball comedy His Girl Friday (1940) at 8:30 a.m., the Western Rio Bravo (1959) at 2 p.m. and World War II drama Air Force (1943) at 4:30 p.m.
Prime time lineup: TCM's guest programmer for November is New York Congressman Steve Israel, who likes to watch the network after a long day at the Capitol. Israel's two prime time selections are (unsurprisingly) political movies starting with The Candidate (1972) at 8 p.m., which Israel says "provides the most authentic view of campaigning that I've ever seen in a movie." Israel calls Mr. Smith Goes to Washington (1939) at 10 p.m. a "political cult classic." Late night pick: Israel also enjoys watching family comedies like Mr. Blandings Builds His Dream House (1948) at 2:15 a.m., which the congressman says is "so simple and beautiful." Mickey Rooney as Andy Hardy and Ann Rutherford as Polly Benedict. Three daytime picks: The theme is movies starring Ann Rutherford starting with three of the Andy Hardy movies in which she appeared as Andy's squeeze, Polly Benedict: Judge Hardy's Children (1938) at 7 a.m., Out West with the Hardys (1938) at 8:30 a.m., and The Hardys Ride High (1939) at 10 a.m. She also appeared as Red Skelton's girlfriend in the mystery movies Whistling in Dixie (1942) at 1 p.m. and Whistling in Brooklyn (1943) at 2:30 p.m. One of Rutherford's most unusual films is the noir Two O'Clock Courage (1945) at 4 p.m. about a female cabbie who gets mixed up in a murder investigation. Prime time lineup: The documentaries continue with movies about sports starting with The Endless Summer (1966) at 8 p.m., which brought California's surf culture into mainstream America. Hoop Dreams (1994) at 9:45 p.m. follows two young men from Chicago who are trying to become professional basketball players. Late Night Pick: TCM is airing music documentaries in late night including a newly restored version of Elvis: That's the Way It Is (1970) at 4 a.m.
Three daytime picks: A birthday tribute to Rock Hudson who was born Roy Scherer, Jr., on Nov. 17, 1925, in Winnetka, Ill. Hudson was one of the top stars of the 1960s in movies like the spy thriller Ice Station Zebra (1968) at 9:45 a.m. which was Hudson's favorite among his own films. The afternoon lineup features two of Hudson's most iconic roles, including his performance as a scion of a Texas oil family in Giant (1956) at 2:45 p.m. and his rom-com with Doris Day, Send Me No Flowers (1964) at 6:15 p.m.
Primetime lineup: The theme is movies about female con artists starting with Veronica Lake and Joan Caulfield as two grifters on the run who end up in small town Maine in The Sainted Sisters (1948) at 8 p.m. Next. 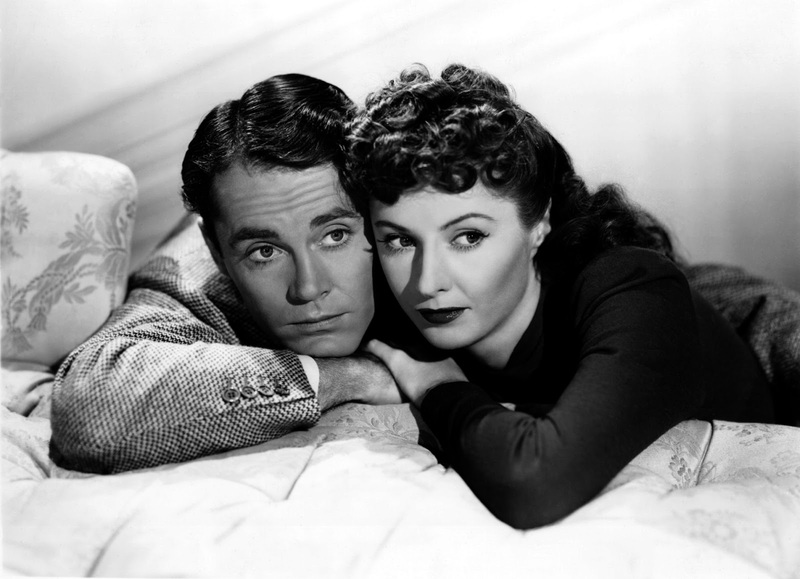 lady card sharp Barbara Stanwyck gets the best of naive rich boy Henry Fonda in The Lady Eve (1941) at 9:30 p.m.
Late Night Pick: One of the best James Cagney-Joan Blondell films is Blonde Crazy (1931) at 11:15 p.m. in which they play a pair of quick-fingered hotel employees. 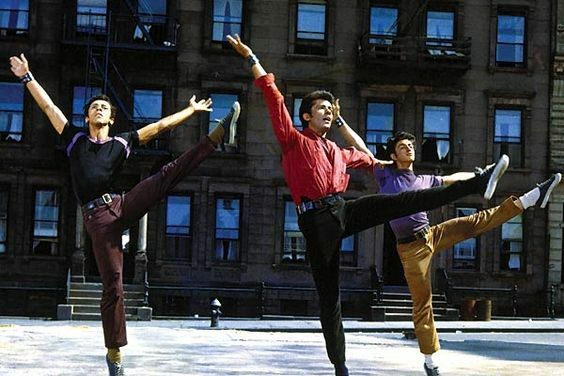 The opening scene of West Side Story (1961). Three daytime picks: The theme is movies about marrying for money. The musical Higher and Higher (1943) at 9:45 a.m. finds Michele Morgan as a maid who masquerades as a rich heiress to catch the attention of Frank Sinatra. Jean Harlow plays a chorus girl who works her way through Lewis Stone, Lionel Barrymore, Hale Hamilton and Franchot Tone in pursuit of a rich husband in The Girl from Missouri (1934) at 2:30 p.m. She's Got Everything (1938) at 3:45 p.m. is a screwball comedy that stars Ann Sothern as an heiress turned secretary. Prime time lineup: Each Friday in November TCM is celebrating the career of star of the month Natalie Wood. This week's films focus on her sixties movies starting with her performance as a repressed teenager in twenties Kansas in Splendor in the Grass (1961) at 8 p.m. followed by her performance as Maria in the modern Romeo and Juliet musical, West Side Story (1961) at 10:15 p.m.
Late night pick: Wood and Steve McQueen have a very modern romance in Love with the Proper Stranger (1963) at 1 a.m. The prime time line up is all about Michael Caine as swinging sixties spy Harry Palmer in three films: The Ipcress File (1965) at 8 p.m., Funeral in Berlin (1966) at 10 p.m., and Billion Dollar Brain (1967) at midnight. The Sunday Night Feature will put the spotlight on two Deanna Durbin musicals with two of the classic soprano's biggest box office hits Nice Girl? (1941) at 8 p.m. and I'll Be Yours (1947) at 10 p.m.